My world record attempt Panamerica Solo has more than 200.000 meters of climbing and goes up to 4.200 meters at the top of Passo da Yama in the Andes. Good reasons for an high altitude training in the Rocky Mountains. Already the past two weeks I had been on average altitude of around 1500 meters in Utah and could adapt myself to the upcoming challenges. I pcypcled into Colorado five days ago and the road went 0 up to a high plateau at 2200 meters. The next day I had the first 3000 meter pass and reached high mountain territory. 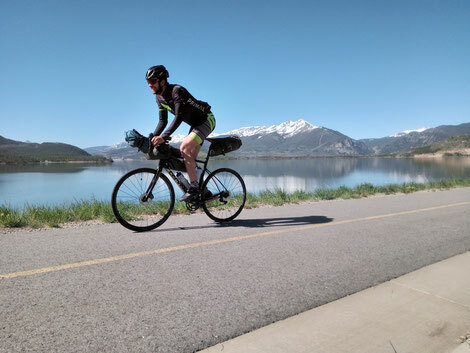 Although Monarch pass is not steep, the length and lack of oxygen make him a challenging ride. In the downhill from the pass it starts to snow, what a change as I was still riding in the desert two days before. Cold and shivering I reach Buena Vista in the valley and am happy that I don't have to sleep in my tent. I get hosted by fellow cyclist Richard and it is nice to share some stories from the road. The next day comes the first proper challenge as I climb the Indepence pass. The professionals ride it regularly during the US Pro Tour Challenge and the climb often decides about the victory. I am lucky and have the pass just or me as it is still closed for traffic. I climb strong and enjoy an 80 km downhill to the Colorado River as reward. The next day I follow the river before climbing Veil Pass an easy day before the King's stage to North Americas highest mountain. As a warm up Inside across Loveland pass before tackling the 4350 meter high Mount Evans. Although it is seldom very steep the climb rises more than 2000 meters and the lack of Oxygen make it one of the toughest climbs I have ever done. First the road rises through thick forrest before winding spectacularly alone the cliff, offering a view down to Colorado's capital Denver. I still feel strong and start overtaking other cyclist that push their bike due to the elevation. At 4000 meter I also start to feel the lack of oxygen and have to slow down a bit. But the effort is worth it then at the peak I enjoy an incredible view across Colorado's highest mountains. Before it gets cold I had back down and find a warmer sleeping spot for the night.